09 FebWho shot Mr. Ramiro? Strange things happen on dark nights! It’s pitch dark night. Suddenly northern lights appear in the sky. Aurora Borealis – whether they announce happiness or disaster? You are right: we are in the far north. But how did Señor Ramiro, a child of Spain, get here? And why is he shot (Chupito Ramiro)? Can the perpetrator be found among the clarinets? The brass players chase the suspects and the clarinets can grate so much liquorice, you don’t believe them…. The moon rises and Jules Verne’s face appears in it. What is Jules Verne on the moon? Jules told “Tales of a distant Star“. Mysterious music sounds and Baba Yetu from the computer game “Civilization IV” appears. Now a small, human-like creature with its unrhythmic gait, called Metro Gnom, appears. A war breaks out in the “Band Land“. That’s just what’s missing: the family of wind instruments is at war with each other, with saxophones and drums acting as policemen. A young clarinettist falls in love with a trumpeter who is injured in the fights. The families are so shocked by what they have done that when the trumpeter finally gets well again, a great reconciliation takes place and the families live in harmony. You’ve long noticed, it’s a crazy dream. 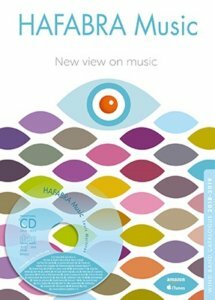 The result of new releases by HaFaBra Music with compositions by Derek Bourgeois, Søren Hyldgaard, who unfortunately died last year, by Hardy Mertens with his unfathomable musical humour. You will also find music by the Japanese Naoya Wada and Yo Kitano. Hugo Alfvén from Sweden is represented as well as Suzanne Welters from the Netherlands and many other well-known composers. A beautiful, extensive program, which we have combined with a lot of additional information.